The V&A Museum of Childhood holds a rich collection of swaddling bands and accessories, which date back to the 16th-century. Being responsible for the V&A Museum of Childhood’s clothing collection and having given talks and workshops on the practice of swaddling, I felt I had a pretty good understanding of it. Until recently I had always thought it an archaic practice that verged on the neglectful. This point of view had been informed by historic accounts of swaddled babes that had been hung on hooks, fallen into fires or mauled by roaming hogs as their parents worked in factories or in the fields. However since the birth of my child earlier this year, I have had to radically revise my view. I have realised the merits of swaddling. 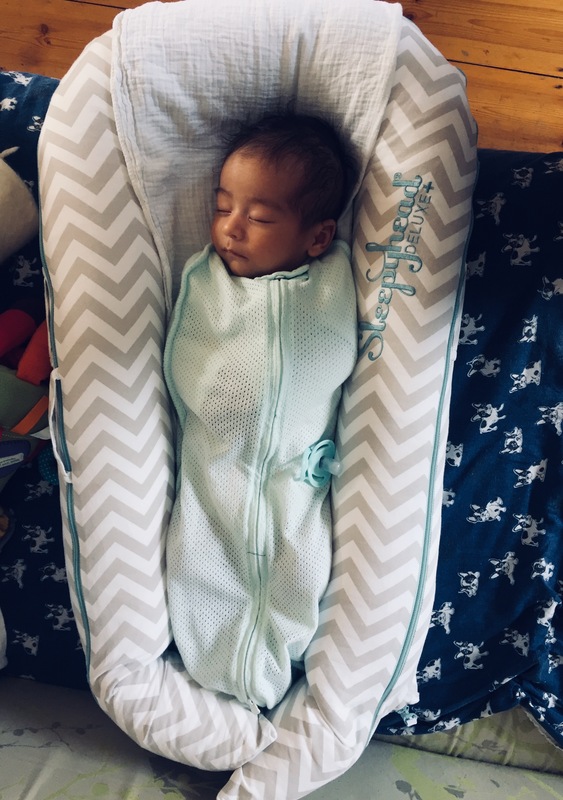 As my baby cried in distress due to colic, hunger, tiredness, wind, being too hot, too cold, wanting attention, requiring less attention…or perhaps just to test out his vocal range and newly working tear ducts, it was being swaddled that reassured and settled him. When his flailing limbs were cocooned, womb-like again, he no longer startled himself awake. Although I did not re-enact traditional swaddling, I did put him in something that resembled a lightweight straightjacket (fig.1). This modern-day, single-layered swaddling looks like an elasticated, easy release grocery bag and is a far cry from the intricate and exhaustive layers of swaddling, which British children born before the 20th-century would have experienced. For those unlucky babies, swaddling could have consisted of up to 11 intricate layers! A feat more impressive when you consider how much a baby wiggles, defecates and that each layer was fastened with sharp pins (the safety pin was not widely used until the late nineteenth-century). The first and most important layer was a rectangular piece of cloth or napkin (nappy). It would have been folded in two and packed with soft rags or sphagnum moss (which has natural antiseptic properties). The rags or moss would have helped absorb the waste and unlike the eight million nappies disposed of everyday in the UK, these nappies could have been rinsed out and reused. The next layer would be a ‘bellyband’ or a ‘binder’. Like the name suggests this thick band of linen was bound around the baby’s stomach and was intended to provide support for the abdomen and protect the baby’s bellybutton and the remains of its umbilical cord. On top of that would be the baby’s ‘first shirt’, a simple T-shaped, front opening shirt made of linen. There are several examples in the V&A Museum of Childhood, which were worn by children of varying economic backgrounds. One of my favourites is from the late 18th-century and is inscribed with ‘Hugh Hill born 1770’ and belonged to a family of yeoman farmers from Derbyshire. The linen shirt is crudely made but carefully utilises scrapes of early printed cotton to decorate the turned cuffs. In the collection there are examples of elegant first shirts from wealthier households, trimmed with lace that were part of elaborate layettes. Despite the diverse socioeconomic backgrounds of the babies’ families, both items feature refashioned decorative pieces of cloth. The widespread recycling of materials is indicative of the relative cost of cloth at that time. On the baby’s head would be a triangular shaped cloth, covered by one or two caps. The first cap was usually rather plain, whilst the second one on top, would have been more decorative. Then a ‘bed’ which was a rectangular shaped cloth with pleats at the top, that would be wrapped around the baby and folded over its feet. This would effectively make a tidy parcel of the baby, holding down its limbs. 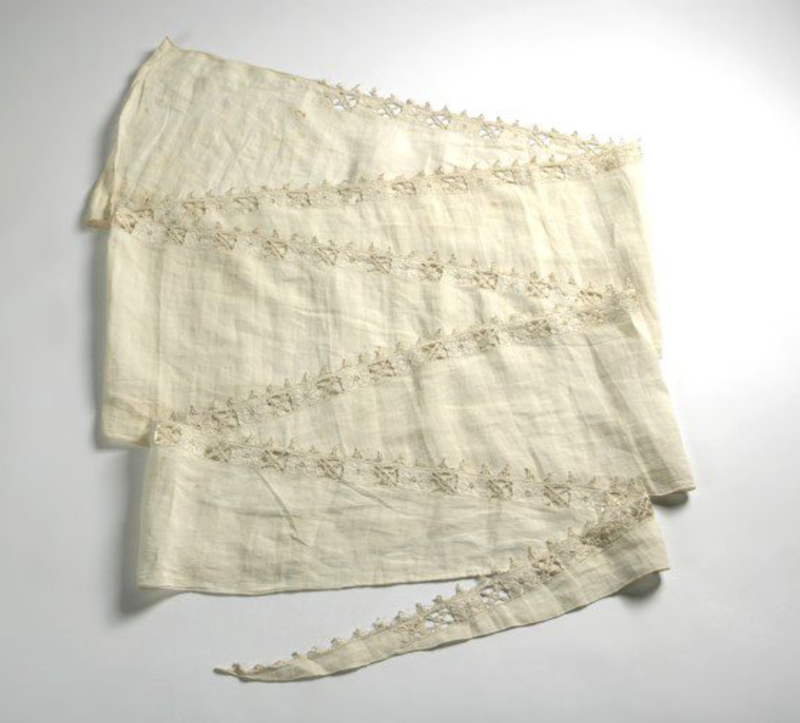 Over this a three metre long swaddleband (a band of plane or highly decorative linen) would be wrapped or swaddled around the child in a variety of diagonal or herringbone patterns (fig. 2). A bib could then be added on top. The last layer was a ‘stayband’ whose function was to keep the baby’s head stable. This band was placed under the cap and pinned to the baby’s clothes at the shoulders. Applying all these layers would have taking herculean effort and a cast iron will. The baby’s arms would have been bound to their body, their legs wrapped together straight and their head would have been unable to turn. It sounds torturous for all concerned. These restricted conditions would have been reminiscent of the tight conditions of the womb, but without the advantages of regulated heating, room service and an en suite bathroom which the womb provides. With the average newborn baby requiring around eight nappy changes a day, it’s hard to imagine that a carer or baby would have undertaken this process multiple times a day. Instead the child is more likely to have remained restrained for prolonged periods of time, putting it at risk from overheating, infections and restricted bowels, as the physician, Dr William Cadogan (1711-1797) noted in his work “An essay upon the nursing and management of children from their birth to three years of age” (1748). The greatest risk was the multiple layers that made it difficult for a child to regulate their temperature. Babies struggle to regulate their temperature making them vulnerable to overheating, fevers and consequently seizures, which can be life threatening. This was proven and recorded by Dr William Cadogan when he was appointed physician in 1754 at the Foundling Hospital in London, using a brand-new piece of medical equipment, the thermometer. Cadogan argued against the use of swaddling and echoed the concerns of other leading figures in the Enlightenment period such as Dr John Locke (1632-1704) who wrote in “Some Thoughts Concerning Education” (1693) that children wear light and liberating clothes which would enable them to move freely, these thoughts were also voiced later by Jean-Jacque Rousseau (1717-1778) in “Emile or On Education” (1762). Despite these widely publicised views the practice of tightly swaddling babies continued into the nineteenth and early twentieth-centuries. This was due in part to the misguided recommendations of midwives and family members who believed that tight swaddling enable babies’ limbs to grow straight and also due to dire financial conditions, which forced parents to return to work and leave their babies at home, contained in swaddling. Loose swaddling in blankets, muslins or new products such as the Wombie Air Baby Swaddle, Grobag, or Gro Snug appear to have the benefits of traditional swaddling to settle a child, but with the the application of new materials such as elasticated mesh that allows babies to move and to regulate their temperatures, as well as clever design, which makes these forms of swaddling adaptable and simple to open and close. This is a good example of how past practices can inform better new designs for today’s children and their sleep deprived parents. Figure 2. Swaddling band, Italian, white linen, trimmed with whitework, ca. 1590-1600. Image © Victoria and Albert Museum.